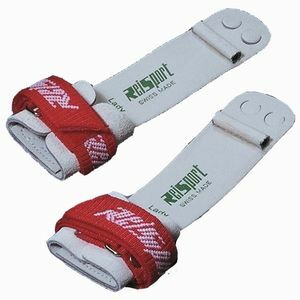 Featuring two finger holes and a small rubber dowel that is attached with adhesive and sewn to the grip (not simply tied on), these Reisport grips for uneven bars provide a Velcro® closure. Often referred to as the finest dowel grips on the market today, this is another example of why our customers choose Reisport grips again and again. Comfortable and designed to reduce or eliminate all irritations, chafing and bleeding that might be caused by lesser grips, these hand grips for gymnastics are designed to make practice or performance a positive experience. These are part of the family of grips from this Swiss manufacturer that includes the Hyper Protec Lady, buckled grips, Elite Protec Ring grips, and others, including a solid selection of men’s grips products. You’ll find them all here, and if you aren’t able to locate the item you have in mind, let us know. We have a long-established network of vendors and can easily take care of your gymnastics or cheer equipment needs. Please note size when ordering. Helpful hint: It's always a good idea to have a backup pair during meet season! I ordered these grips for my daughter and was very impressed when they arrived in less than 48 hours. The service has been excellent as has the products. These are top-notch grips for a good price. I had the gymnastics coach review this product before I purchased it and she confirmed my impressions. Thank you for making it so easy for non-gymnists to find quality products at a good price!